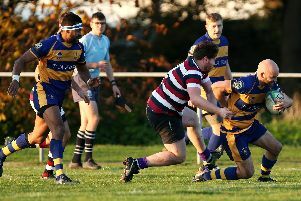 George Hillan is hoping Gosport & Fareham will comeback refreshed and recharged from their week off as they return to London two south west action against London Exiles on Saturday. It is a crucial game for both teams who occupy the bottom two places in the league. The Blue & Golds are feeling positive after pushing second-placed Old Alleynians hard in their last game. They also boast a home win against Farnham who were second in the league when they visited Gosport Park. Head coach Hillan is looking for a similar committed performance from the hosts (2.30pm). He said: ‘The break from league action was welcome and beneficial. ‘It not only allowed the players to recover from their bumps and bruises but also spend some time with family and friends. ‘Following a review of what is being delivered and how we deliver it, the coaching staff have started to implement aspects the players have asked to be included. ‘We will add more aspects over the forthcoming weeks. ‘What we have introduced does not change our processes or structure which has been developed since the new coaching staff were introduced in July. ‘The focus has been purely on Gosport & Fareham, how we will play and what we aim to achieve from games. ‘We need to remain calm and make sure chances we have worked hard to create are converted, rather than panicking and making rash decisions. Fareham Heathens host Bognor on Saturday in the Hampshire Premiership at Cams Alders (2.30pm). The home side are looking to bounce back from their disappointing RFU Junior Vase exit. Player coach Dave Wheaton said: ‘Poor availability was costly and it showed with players not used to each other on the day. ‘This week we are at polar opposites with high availability allowing us to field a full-strength squad. ‘Training has gone very well, with the main focus on presentation allowing for quick ball. ‘Too many times in the past we have been guilty of slowing things down too much. ‘That allows time for the defences to set and we lose momentum. Doug Barrow moves to inside centre, Rob Impey switches to number 13, Kris Owens is on the wing and Rikky Curtis is back from injury at openside flanker.